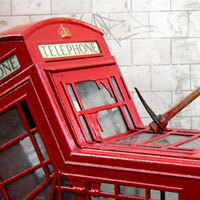 April 13, 2006 / London: Banksy phones home. Has Banksy been hanging out with Christo and Jeanne-Claude? His latest piece appeared in Soho Square one morning earlier this month: a pickaxed BT telephone booth, bent double and bleeding. Banksy’s political signals are usually easier to decode than this (check out his web site for some fine examples), but my guess is that he’s not a huge fan of mobile phones. While he has previously favoured the “public-wall-as-canvas” aesthetic, the phone booth installation takes his work into the 3D realm (something of a trend amongst spray-can artists perhaps?). It’s no wrapped Reichstag or Central Park Gates, but then neither were those pieces any pickaxed phone booth… Now there’s an artistic collaboration I’d love to see. Perhaps they could start collecting people creating likenesses of people who like to keep their mobiles on speakerphone (you know, to improve everyone else’s reception? ), and then wrap them up somewhere central and go to town on them with gardening equipment. Just a thought. Then again, maybe it’s not cell phones at all. Could be that Banksy’s just not a David Tennant fan.